Citizens Committee for New York City, the Manhattan Solid Waste Advisory Board (MSWAB), and Manhattan Borough President Gale Brewer invite you to apply for a grant of up to $750 to start or expand a compost program in any of the five boroughs of New York City! 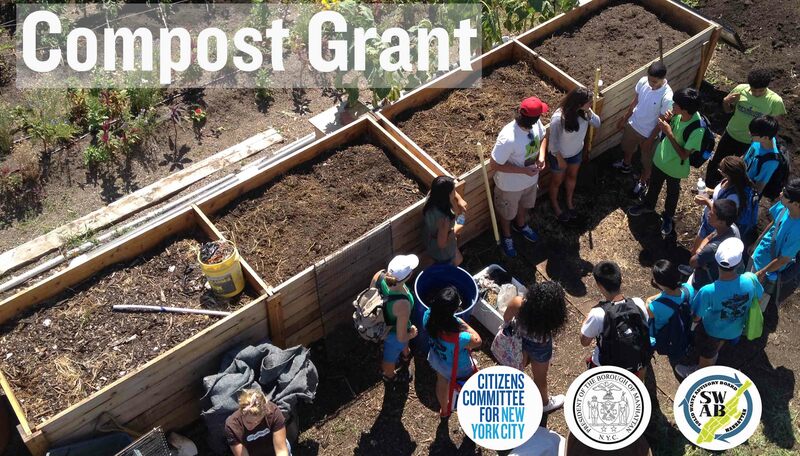 Grants are awarded to community associations, community gardens, friends of park groups, schools, colleges and universities, private businesses, housing developments, and schools working on neighborhood composting programs. On the following pages are the grant guidelines and application. Feel free to contact us for more information. For more information, please contact Katie Grassle at 212-822-9567 or kgrassle@citizensnyc.org. Grants will be announced by April 19, 2019. Funds should be used for building or purchasing equipment and tools for a compost system as well as signage or other resources for community outreach. Funds cannot be used for planning or personnel expenses. Awardees must assume all liability for their projects and sign an agreement governing the project. Submitting an application is easy: You can do it! We discourage using a third-party grant-writer to prepare the application. Just follow the instructions and answer all the questions clearly and with enough detail. Describe a project that begins or expands a composting project in your community. Estimate how much it will cost and request a grant amount that accurately reflects that cost. It's as simple as that. The Manhattan Solid Waste Advisory Board (MSWAB), a citizen advisory board appointed jointly by Manhattan Borough President Gale Brewer and New York City Council members representing districts in Manhattan, announces its 8th Annual Community-Scale Composting Grant to provide funding assistance for community, small-scale organic waste diversion initiatives across the city in 2019. The SWAB membership consists of individuals from community boards, recycling and carting industries, environmental organizations, property owners, tenant organizations and members of the general public. The MSWAB advises the Manhattan Borough President, City Council and City administration regarding the development, promotion and operation of the city’s recycling program. Recommendations for the city’s recycling program include methods to encourage greater participation, educate the public and increase waste diversion rates. Citizens Committee for New York City works with a wide network of grassroots groups across the five boroughs, supporting resident-led groups working in low-income neighborhoods undertaking projects addressing issues that they identify as important to them. In 2018, we awarded over $1.9 million in grants and services and provided hundreds of hours of skills-building workshops and project-planning assistance to 461 resident-led groups. In addition to grants, Citizens Committee provides resources, workshops, and project planning assistance to resident-led groups from across New York City. The Manhattan SWAB, the Manhattan Borough President’s Office, and the Citizens Committee believe that organic waste diversion is central to the City’s goal of zero waste to landfills and incinerators by 2030. We believe that we can reinforce this goal through this grant program in supporting community-based groups to compost in their communities, diverting organic waste and in the process reaching members of their community and providing an invaluable education service to familiarize New York City residents with the concepts and benefits of local management of our organic waste. Properly managed, the small-scale local processing of organic materials produces compost, a natural soil amendment, and delivers many environmental benefits to communities. Compost increases the nutrient content and moisture retention of soil and eliminates the need for chemical fertilizers. Diverting organics from landfills also reduces the production of methane (a potent greenhouse gas) and leachate, a potential fresh water contaminates. Additionally, local organics separation and diversion can spur business opportunities, such as pedal powered micro-haulers and reduce costs associated with bagged landfill waste litter and cleanup. Since its inception in 2011 the program has granted over $158,197 to 216 groups to undertake composting projects in their neighborhoods in all five boroughs. If you have any questions, please contact Katie Grassle at 212.822.9567 or kgrassle@citizensnyc.org. All selections will be made solely by the members of the Manhattan Solid Waste Advisory Board (SWAB) and Citizens Committee, and awards will be announced by April 19, 2019. PLEASE READ: This application form does not automatically save your work. We strongly recommend that you save your work frequently to avoid losing information. You can save your work and resume later by checking the box at the top of this page. Remember to write down your username and password, as you'll need those to continue working on the application at a later time. NOTE: If you are a past compost grantee: 1) please fill out this application as if it were your first time applying for a grant from us; 2) if you received a grant from us in the past three years, please check that you submitted a final report for those grants. We are not able to consider your application otherwise. If your group received a grant from us in the past three years, have you submitted a final report for that grant project? If your group has submitted applications in the past under a different name (even slightly different), what was that name? Please list two contact names for your group, including working phone numbers and emails. (Both contact persons should be able to discuss the application, as we may call for more information). If awarded a grant, we will consider the person listed first as your group’s main contact person. We do not communicate with third party grant-writers. Please make sure that there are no extra spaces within or after the email address, and that an "@" symbol is included. Can we send you a text message (once in a blue moon) at this number? Will this person be actively involved in carrying out the grant project? This person must be different from Contact 1. Please indicate a mailing address. (You must be able to receive mail at this address). Please remember to include an apartment number, if necessary. Please list the address where the project will take place, or cross streets if there is no address. (Mail will not be sent there). If the project is taking place in more than one location, indicate a second address, or cross streets if there is no address. Have you saved your work yet? Please do so by checking the box at the top of this page. Remember to write down your username and password, as you'll need those to continue working on the application at a later time. In what neighborhood(s) and borough(s) does your group currently work? Select "citywide" for borough only if your group is truly working in neighborhoods across the city. In what year was your group formed? Would this be the first project your group carries out? If your group is a project of a paid staffed organization, what is the name of that organization? Does your group have 501(c)(3) status? Note that groups are not required to have this status to receive a grant from us. If your group's 501(c)(3) status is pending, please state that. If your group is on the web, please list the links. Has your group received a grant from Citizens Committee in the past? If yes, please list the year(s) in which you received the grant(s). Have you saved your work? Please do so by checking the box at the top of this page. Remember to write down your username and password, as you'll need those to continue working on the application at a later time. Please note that from this point forward, all the questions relate to the one specific project for which you and other members of your group are submitting this application. Describe the project and its goals in detail, including why it is important for your community (half page to one page). Please attach drawings or schematics as additional attachments, if applicable. You may add up to three photos (file must be less than two megabytes and in one of the following formats: .bmp, .jpg, .png, or .gif). What experience do you have with composting? Indicate your level of expertise and/or plans for training. How will you measure the amount of food scraps collected? What is your estimate of food scraps and organics that will be collected over the course of the project? Please list all volunteers and/or partners who will help to coordinate and run the project. How will your group conduct outreach and education related to compost in your community? How will you continue the project after the initial grant funding? Provide us with a detailed work plan and timeline for your project implementation. If the project centers on a single event on a particular date, list all the steps involved in organizing and carrying out the event. For an example of a work plan, please refer to our model application. Please indicate approximate project completion date. Remember that our grant announcement will be made in late April. Tell us how much your project will cost - list all the items you will need to carry it out, including accurate estimates. Please contact us if you need help creating or thinking through a budget. Enter only numbers, commas, or decimals. Do not enter '$' symbol. Are there other funders (besides Citizens Committee) for this project? If yes, please list below. If awarded a grant, the grant may not equal the amount requested by your group, depending on whether budget items and amounts fall within our guidelines. Applicants will be notified of grant decisions by late April. Grantees will be invited to a meeting (beginning in mid-May) to discuss the project further and to pick up the grant check. Section 6 of 6: How Did You Hear About Us? How did you hear about the Compost Grant? (Please check all that apply. Your response helps us improve our outreach). You're almost done! The hardest part is over. Click the submit button below and follow just a couple more steps. You're almost done! The hardest part is over. Please click here to download a funding cover sheet. Please fill the funding cover sheet out and upload it to your application. Click the submit button below and follow just a couple more steps.